1794 Needlework Piece (Image courtesy of Reflections of the Past) This needlework was described as: "A late 18th Century embroidered mourning scene for a young child is worked on an ivory silk ground. 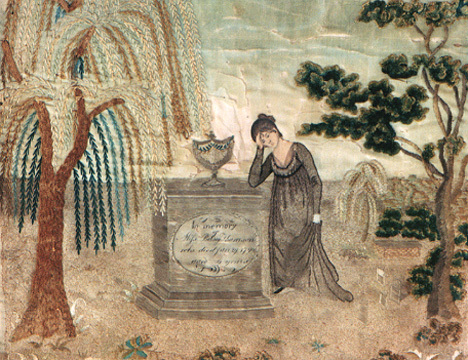 The stylized scene includes a central tombstone with the inscription written in ink on silk: `In memory of Mifs Betsey Thomson who died Jun 29 1794 aged 4 years.' Also in the scene is a woman in a black dress, three trees (two weeping willow), and tombstones. The large sky area is painted as was typical in this type of needlework. The woman's face is sketched on paper. Size: 9X12 inches. The embroidery in the picture is in very good condition but the silk fabric is deteriorating where there is no embroidery. The sky area is crumbling and there is some damage on the tombstone where the insription was written. The picture is in a period frame. $1095.00"
Below: Mourning Dresses, click on image to go to big image with details. Below: Half-Mourning Dresses, click on image to go to big image with details. 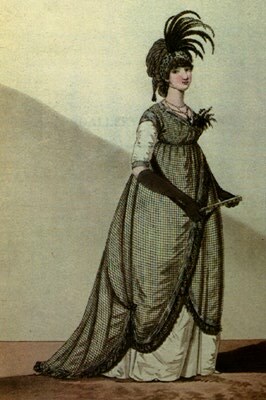 Afternoon Dress, Half-Mourning, The Gallery of Fashion (May Issue 1798) This dramatic black and white gown is worn with black gloves, a sign of mourning. The black net overdress has a black lace trim. The corsage and plumes are dark, and spotted bandeau which the feathers tower over, gives the headdress an exotic touch. Black jet beads and a black cross are typical of mourning jewelry. Mourning Dresses, The Repository of Fashion, 1809. The elegant widow wears black gown with a white lace collar and gold ribbon tying under the bust and falling down the skirt. The blue scarf and slippers add some color to the dress as well. The urn adds an appropriate funerial air. Evening Dress, Full Mourning,The Repository of Fashion, 1816. I love this Gothic image of the greiving lady. Her veil and cross echoes the clothing of the heroines of the Gothic novels popular at this time. The jewelery and beading on the dress are of jet. Two rows of black roses band the bottom of the skirt. 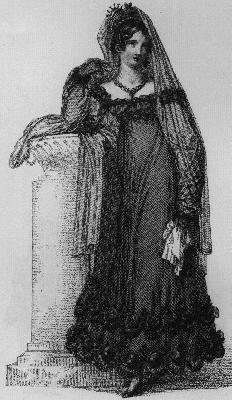 Carriage Dress, Mourning, The Repository of Fashion, 1816. This lady has a Russian wrapping-cloak with a deep pereline on. The cape is open in the front, so we can see the black dress beneath it which is trimmed with puff and rouleaux of black crepe. The Parisian bonnet is trimmed with black crepe and black crepe roses and is over a cornette of white with black edges. The reticule is black velvet with white silk trim, while the shoes and gloves are black leather.